Never fear, the CIA’s Jack Ryan is here. Amazon has renewed Tom Clancy’s Jack Ryan TV show for a second season, nearly four months ahead of the action drama’s August 31st series premiere. According to Amazon, executive producers Carlton Cuse and Graham Roland are set to continue as co-showrunners. An Amazon political thriller, featuring the fictional hero of book and film fame, Tom Clancy’s Jack Ryan stars John Krasinski in the title role. The first season also stars Abbie Cornish, Wendell Pierce, Ali Suliman, Dina Shihabi, and Amir El-Masry, with Peter Fonda, Mena Massoud, Timothy Hutton, and Al Sapienza recurring. Check out the Amazon press release to learn more about season two of Tom Clancy’s Jack Ryan. SEATTLE—April 24, 2018—(NASDAQ: AMZN)—Amazon today announced it has greenlit season two of Tom Clancy’s Jack Ryan ahead of its global series debut set for August 31 on Prime Video. Tom Clancy’s Jack Ryan, from Paramount Television and Skydance Television, is a reinvention with a modern sensibility of the famed and lauded Tom Clancy hero played by John Krasinski (A Quiet Place, 13 Hours). The creators of the series, Executive Producers Carlton Cuse (Lost, Bates Motel) and Graham Roland (Fringe, Prison Break), will continue to serve as Co-Showrunners. Additionally, Krasinski, who also serves as an Executive Producer, will be reunited with Wendell Pierce (The Wire) who will reprise his role as James Greer in the eight-episode second season. After Amazon’s Super Bowl ads, Amazon saw a more than 400% increase in Prime members placing Tom Clancy’s Jack Ryan on their watchlist. Prime members will be able to stream Tom Clancy’s Jack Ryan exclusively via the Prime Video app for TVs, connected devices including Fire TV, mobile devices and online at http://www.amazon.com/originals. Members can also download the series to mobile devices for offline viewing at no additional cost to their membership. The first season of Tom Clancy’s Jack Ryan will be globally released on August 31 and available on PrimeVideo.com for Prime Video members in more than 200 countries and territories. What do you think? Are you a Jack Ryan fan? Do you plan to check out the first season of Tom Clancy’s Jack Ryan TV series? Let us know, below. More about: Amazon TV shows: canceled or renewed?, Tom Clancy's Jack Ryan, Tom Clancy's Jack Ryan: canceled or renewed? Tom Clancy’s Jack Ryan: Is the Amazon TV Series Cancelled or Renewed for Season Two? Looking forward to season two ; when will it be coming out? Very well cast and I have watched it five times completely. 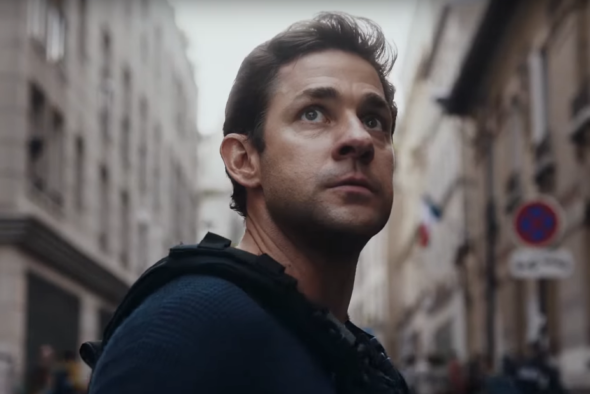 I’m sure that John Krasinski’s stocks have risen since The Quiet Place, thus driving more viewers to Jack Ryan and Amazon in the months to come.